Inside the vast Goodwill As-Is warehouse, people sift through long, shallow tubs of clothes, bedding and accessories. Others sit and wait for the next set of bins to be rolled out. Some shop for themselves, others are reselling, and many customers and employees are on a first-name basis. 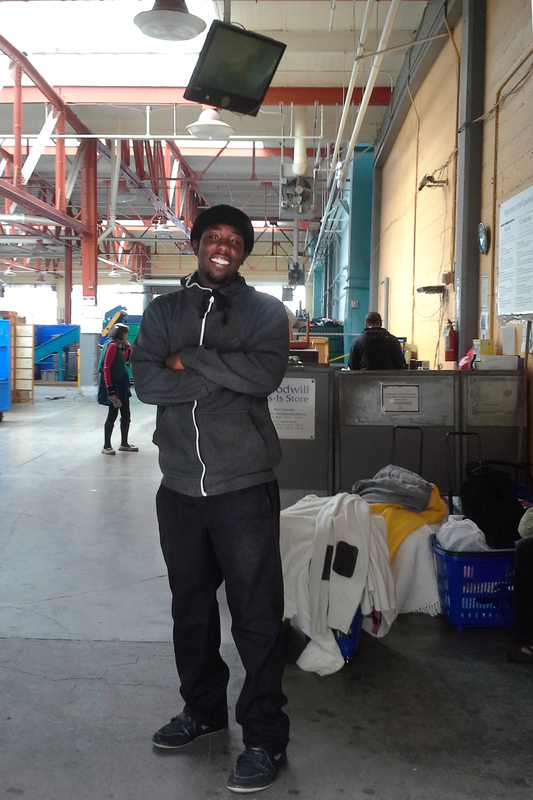 Since April, Gredon Daggs, 23, has commuted 60 minutes round trip from his East Bay home to the As-Is store at Mission and 11th streets to work security at the door. His employer, Armada Protective Services, contracts with Goodwill. Daggs started at $12 an hour when he got the job a few months ago and today is up to $13. With his good attendance and lack of demerits, he expects to get another dollar raise next month. But, while he works 40 hours a week, he receives no benefits. Earning time-and-a-half pay on holidays is the job’s lone perk. He said he hasn’t thought much about the current push to increase San Francisco’s minimum wage, and hasn’t had much financial trouble. He is used to living within his means and is generally able to keep finances in check. But living on a limited income poses a challenge. He spent a year at Oakland’s Laney College but was forced to quit when he started working full time. Daggs is polite and soft-spoken with an easy smile, but he acknowledges that working security can be a dangerous job. Mostly his day involves kicking out shoplifters. But sometimes the miscreants turn violent. Daggs regularly deals with customers who are unruly, intoxicated or high, but says meeting new people and having interesting conversations is still the best part of his job. Unlike other security jobs, where much of the day is spent standing around, the constant influx of customers and activity brings human interaction. Daggs named a few reasons to commute to San Francisco. Employers in the city generally pay more—with a higher minimum wage of $10.74 an hour to Oakland’s $8—and he lives right across the street from his local BART stop, simplifying his commute. And “I wanted to get out of Oakland,” he said. The change of pace and bustling downtown location suits him, offering a different environment from the city where he grew up. Before Goodwill, Daggs worked two jobs to make up a full-time schedule. In addition to security, he worked as an in-home aid—another challenging job with low pay. For now, Daggs is happy with his position and daily commute, one he knows could be much longer and more difficult. He pointed to a co-worker ferrying a bin across the sidewalk. They acknowledge each other and smile. This entry was posted on August 7, 2014 by skettios99.